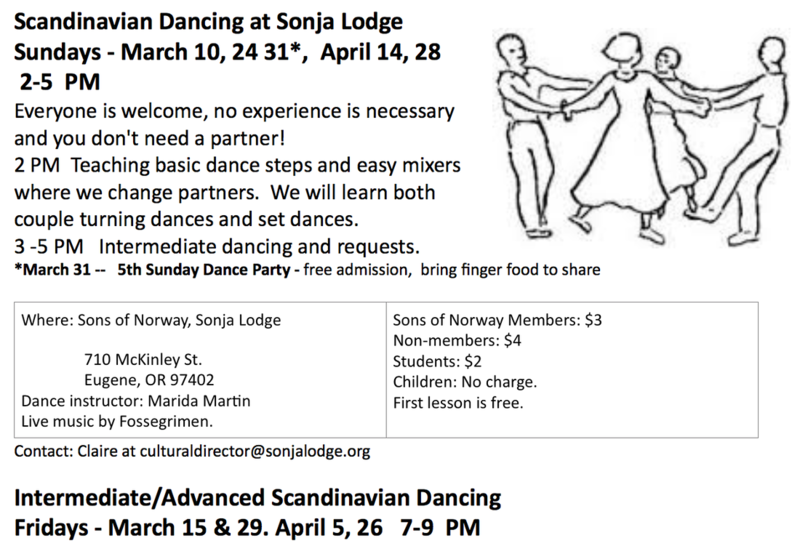 Community Flyers/Events - Norske Runddansere.​ Scandinavian Dance. The Thor Lodge, Sons of Norway, in Salem is again hosting Fossegrimen for their Norway Constitution Day (Grunnlovsdagen). As in the past any interested dancers/listeners are invited to attend. Dancing will be lead by Marida Martin. The Thor Lodge meets at the West Salem Masonic Temple 1625 Brush College Road NW, Salem, OR. 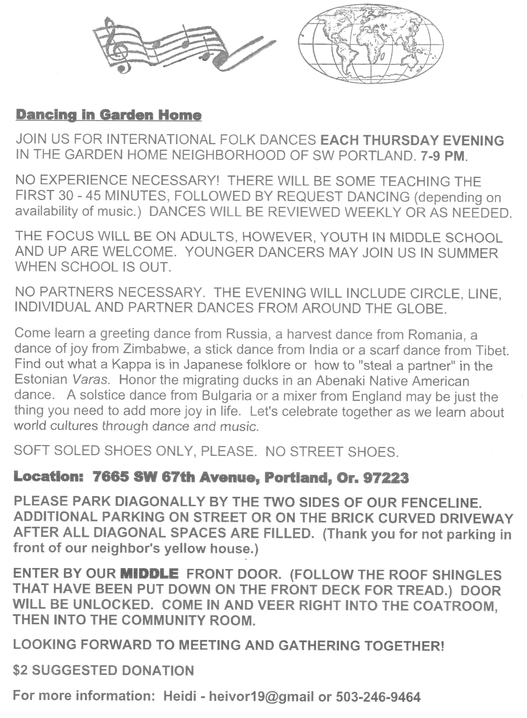 Not necessary to RSVP but encouraged just so I have an idea for dance music programming. Norsk Folkedans Stemne 2019 is proud to present Folkedanslaget BUL Tromso in Poulsbo this summer on August 16, 17, and 18, 2019. They are considering traveling down to Junction City for the festival the weekend before stemne. There may be a stop in Portland, then on to Seattle, and finally over to Poulsbo. They are bringing 15 dancers and musicians. Details are still being worked out and will be sent later as we work together over the next month of planning. We will need help with housing as this is the largest group we have had in some time. We are in the process of finalizing our rental of Grieg Hall in the next few weeks. This includes working out the details of the food program we will be able to offer during the weekend. Reservations have been made at the Poulsbo Inn for rooms at a reduced stemne price. It does include several king size bed rooms in addition to the two queen beds generally in the rooms so housing is appropriate for singles as well as doubles. There are several options for camping, but I only had one person respond to possibly camping. You can take a look at Fay Bainbridge https://biparks.org/fay-bainbridge-park-campground/ and Kitsap Memorial https://parks.state.wa.us/529/Kitsap-Memorial. The Dooninks are still offering their property for camping as well. They have a covered picnic shelter that can have a table in it. They say you can cook there as well.